Book now the best shore excursions in Stockholm. High quality and safety at the lowest prices. Shore Excursion Stockholm: This cosmopolitan city of Stockholm is actually made up of over 30% waterways, and another 30% green spaces. The 14 islands that make up Stockholm are full of fascinating places for our shore excursion to visit. What’s eating: Surströmming, fermented herring served with boiled potatoes and salad. We will meet our guide in the port and will start our tour of this unique Scandinavian city. We will walk to the public bus stop and onboard the bus we will reach the very heart of Stockholm: the area of Gamla Stan. 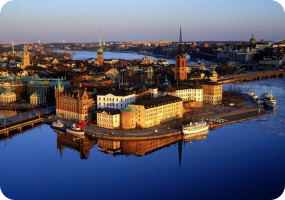 This Stockholm shore excursion will explore the old town of Gamla Stan. The largest and best-preserved medieval town in all of Central Europe, Gamla Stan dates back to the 13th century and is heavily influenced by North German architecture. Also in Gamla Stan is The Royal Palace, one of the most important attractions of the city. This royal residence has over 600 rooms over seven floors, and is also home to three regal museums. Getting lost in the historical centre of the city, its alleys and streets we will meet some of the main interest points of the city: the Main Square, the Cathedreal and the City Hall, where every year take place the celebrations for the Nobel prize. We will enjoy a little free time before getting back to the port. For those who want to enjoy some more time in the city, they can leave the group and stay longer. The guide will be glad to provide useful information on how to get back to the ship.